Our friends up north from safeboater.com are at it again, as they've sent us another disturbing list about boating accidents. And with so many boaters here in the US celebrating Memorial Day by taking the boat out for the first time of the season, we thought we'd share this list with you, too. Lists like this can be depressing, but they serve as an opportunity for us all to keep safety top of mind while boating, even as Safe Boating Week 2010 has come to a close. This time, they have combed through the Darwin Award files of the past dozen years to highlight the top nine boating-related Darwin Award candidates. The Darwin Awards, as you may know, commemorate individuals who "died in spectacularly stupid ways, eliminating themselves and their foolhardy DNA from our gene pool." According to the folks at safeboater.com, the following Darwin Award candidates could have easily prevented death or injury in boating accidents by following just a few simple rules and using common sense on the water. For more safety tips like these, visit our boating safety page. We sincerely hope YOU have a safe and happy Memorial Day. Our Sea Song of the Week was pulled from a Scottish band in the early 90's, but it should be a staple for Memorial Day weekend. It turns out that Big Country's 1980's anthem In a Big Country was not their best song. Editor's note: I think this song sounds like it's a about a heroic soldier. Of course, we could be wrong - it could be a love song. Perhaps it is a song about a soldier in love? Give a listen and decide for yourself. What do you think? drinking needs to be avoided by the vessel operator. Are you launching for the first time this season? Visit our boating safety page for a few more tips and resources. With the holiday weekend and so many boaters actually out on the water, there are not a lot of boat shows... but there are a few big events related to boating. BoatFlorida.com is celebrating a new tradition with its second annual WaterFest at Port Canaveral's Ski Island on Sunday, May 30th. The event, which is being called a celebration of Florida's boating lifestyle, will feature tons of family-friendly activities and a raffle for a new car and up to 1,000 gallons of fuel. And then there's Fleet Week in NY. 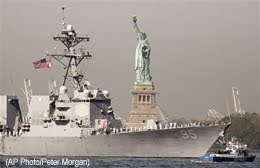 This kicked off Wednesday with a spectacular parade of military ships on the Hudson River, and features events all week. Finally, the boat shows. 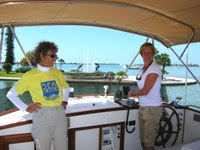 In the US there seems to be only one, and that's the St. Augustine Nautical Festival and Boat Show in Florida. Internationally, there is the Morocco International Boat Show, which would be a nice place to visit for a boat show. Maybe next year! More details and links to more info about these events and more are in our boating event calendar. Boat safely and Happy Memorial Day. These headlines are from around the country from just the past 24 hours. Hey boaters… Let’s be careful out there. There were more, but we were getting depressed. Please be safe out there, this week and all boating season long. Tragic numbers reinforce Safe Boating Week's major message: Wear a life jacket whenever you are on a boat. We're not even at the unofficial start of boating season with Memorial Day Weekend, and some dreadful statistics are already being reported in various parts of the US... right smack dab in the middle of National Safe Boating Week. In South Carolina, boating deaths as of the beginning of May have already surpassed the total number of boating deaths in the state for all of 2009. In the Northeast, 21 recreational boaters and paddlers have died this year, the highest number on record according to the USCG. This year, the “WEAR IT!” message from the North American Safe Boating Campaign is crystal clear and it’s based on the following simple fact. If more boaters wear life jackets, less will die while boating. Nationwide, in nearly 70 percent of the 700 average annual boating-related deaths, the actual cause of death is drowning. 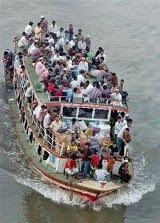 Of that 70 percent, almost 90 percent of the victims were not wearing a life jacket. 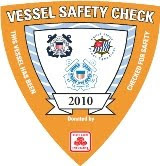 What does "boat safety" mean to you? Here are a few of our favorites. Float plan. Leave one with someone. Safety course. Take and pass one. For more on these and other boating safety tips, visit our Safety on Boats page. Time for our weekly boating event roundup which we hope will inspire you to go to a boat show this weekend, and to boat safely all season. And if you came out to the Mystic Seaport in CT last weekend, thanks for your support! Here in the US, there are boat shows on both coasts with Trawler Fest Anacortes happening today through Saturday in Washington, and the Raleigh Summer Boat Show beginning today in North Carolina and going through Sunday. Details, as usual, can be found on our boating event calendar. Wherever you are in the world, enjoy your boating activities and please boat safely! Some adventurers just can't get enough. We learned today via a tweet from the crew of the Plastiki that one of the folks who helped build the so-called Bottle Boat is now off on another risky record-setting voyage. David Pryce was one of the original folks on the Plastiki project, lending both his skills as a Naval Architect and his experience of sailing around the world. Now that the Plastiki is safely sailing across the Pacific without him (We wonder kiddingly if his spot on the bottle boat was filled by a cockroach after reading the latest blog post from aboard the Plastiki), Pryce is onboard a different boat in another part of the world, bringing attention to another important cause. 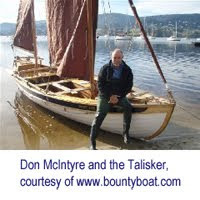 Following in the footsteps of William Bligh when cast adrift from the Bounty, Don McIntyre and the crew onboard the "Talisker Bounty Boat" will sail for Tonga to find extra food and water, then set off to sail across the top of the Fiji and the Vanuatu Island groups, before setting course for the Queensland Coast and a landing at Restoration Island following four weeks at sea on light rations. They then sail north inside the Great Barrier Reef to Thursday Island, and across to Kupang and Timor. Of course the fateful voyage of the Bounty has been reimagined in countless books, songs, plays and movies over the years. The role of Fletcher Christian, who reportedly led the mutiny, has been played by a few actors you may have heard of: Clark Gable, Errol Flynn, Marlon Brando and Mel Gibson to name a few. Going boating this week? With Safe Boating Week coming up, we wish you a safe and mutiny-free adventure. The 2010 version of the weather radio is an app that runs on your smartphone. Mobile Mariner, out of Mystic, Connecticut, has created the latest must-have technology for boaters. Their new app (which currently runs on your BlackBerry, and should work on the iPhone and other handhelds in the very near future) actually does much more than a weather radio. It puts essential information to anyone who lives, works or plays on the water in the palm of your hand. In addition to bringing you the marine weather forecast from the NOAA National Weather Service, the app reports weather conditions invaluable to sailors – including wind speed, wind heading, wind gusts, air and water temperature, and barometric pressure. Mobile Mariner is also a virtual tide chart, showing both predicted and observed tide information, in text and graph format, for all NOAA primary tide stations. Planning a trip? Mobile Mariner has you covered, as subscribers can continuously monitor up to 10 different weather zones and up to 10 different tide stations. 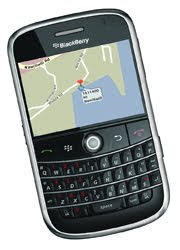 If you've got a BlackBerry with an SD Card, we strongly recommend you download the seven-day free trial from www.mobilemariner.com and give it a try. You can then decide whether it is worth the $5/month during your boating season to keep using the app, a subscription fee which we are told can be started and stopped so that you only pay when you use your boat. 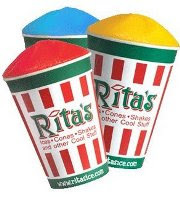 Please comment here with your review of the product after you try it. The Sea Song of the Week is the Sea Song. No, this is not an Abbott and Costello routine, but this week's Sea Song is from the same era. The tune is really called "The Sea Song" performed by Frank Sinatra, who we lost on this day in 1998. Careful where you click, because we could only find this song on what looks like a Russian version of YouTube, and therefore we can't verify where the links go; but we tested it and it seems safe to play the tune. You can find many of our previous Sea Songs on the Daily Boater channel on YouTube, here. 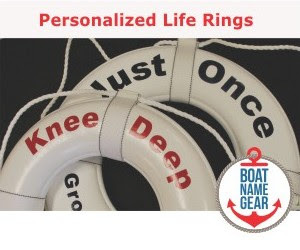 There are a few boat shows around the world this weekend, but our boating gift store, BoatNameGear, will only be exhibiting at one of them. We don't exhibit that often, but when we heard there was going to be a new boat exhibition on the grounds at Mystic Seaport - a living history maritime museum - we couldn't pass up the chance to participate. So this Friday through Sunday, May 14 to 16, we invite you to attend the Northeast Maritime Exhibition. Walk through history and find your future in boating. You'll see the latest boats and gear at the boat show, while you soak up the historic sites of Mystic Seaport. Stop by the BoatNameGear booth and enter our $100 drawing, or just come by and say "hello". We have a discount code that will save you money on your entrance fee, which will get you into both the Seaport and the boat show. If you've never been to Mystic, this is well worth the two hour drive from NY or Boston. For the coupon code and more information about the Northeast Maritime Exhibition visit windcheckmagazine.com. As always, all boat shows (including this weekend's events in Lakewood, NJ, and Portorose, Slovenia) can be found on our boat show calendar. On this day in 1915, the British ocean liner Lusitania was torpedoed and sank in the Celtic Sea. Flash forward to 2009. A musician named Andrew Bird imagines the phrase "I'm the one who sank the Lusitania" and starts to write music and more words to go with it. Just like that - we have our Sea Song of the Week for May 7 2010. If you like Andrew Bird half as much as we do, visit his official website where you can see if this song is ever going to get on an album, among other things. It seems that only one out of 900 moms surveyed indicated they would like to spend Mother's Day at a boat show. A few countries, like the UK, celebrate their version of Mother's Day on a different date. This probably explains why two of the three boat shows this weekend are in the UK. Friday is the first of the three-day, 11th annual, Cotee River Seafood/Blues Festival and Boat Show in New Port Richey, Florida. From the title it sounds like this show has it all... but wait! There's more! They also have a live alligator show every hour throughout the weekend, and a CCR cover band. What more can you ask for this Mother's Day weekend? Also starting Friday is RIBEX 2010 at Cowes in the UK, which claims to be the world's only boat show dedicated solely to Rigid Inflatable Boats (RIBs). So, if you are looking for RIBs, try and get a flight across the pond to the Isle of Wight this weekend. A more traditional boat show is also happening in the UK this weekend - the sixth annual Plymouth Sail and Power Boat Show 2010 is Saturday and Sunday at Queen Anne’s Battery in the UK. And yes, they will also have RIBs. The Northeast Maritime Exhibition comes to Mystic Seaport - the world's largest maritime museum - next weekend, May 14 to 16. Walk through history and find your future in sailing. Join our friends from BoatNameGear and see the latest boats and gear at the boat show, while you take in the historic sites of Mystic Seaport. 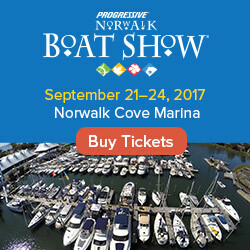 As always, all boat shows, with links to the show websites when available, can be found on our boat show calendar. The commercial fishing industry is obviously already being significantly affected by the ongoing oil spill in the Gulf of Mexico. But what about charter boat captains, marina owners, resorts and even recreational boaters in the region? This boat guide was interviewed by the AP (video below) over the weekend, and states "most of the charters are being canceled... people are not coming down." Just yesterday, Maura Judkis, writing for U.S.News & World Report, posted 10 Things You Can Do to Help the Gulf Coast Clean the Oil Spill. Among her tips, one may be of interest to local boaters. She writes, "BP has called upon fishermen and boaters in the Gulf area to participate in their "Vessels of Opportunity" program." Check out Marua's entire article to learn more about this program. Here's the latest news, as of this writing, on the efforts to stop the spill: Gulf Coast watches, waits for path of oil spill. Another month begins, and so do new boating laws around the country - this time in North Carolina and Maryland. A law we've been warning you to prepare for is now in effect. Boaters under 26 years old in North Carolina must complete a NASBLA approved boating education course before operating any motorboat. Also in North Carolina, it is now illegal to operate a PWC if you are under 14. A new state law went into effect in April now requiring all children 13 and younger to wear life jackets while on a moving boat… this replaces previous a law that allowed children as young as 8 to go without a life vest on recreational boats smaller than 21 feet. Other states are considering new boating laws and enforcing old ones. 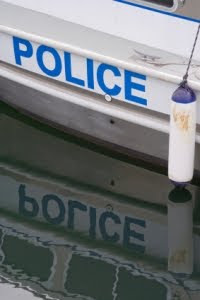 The Harford Courant's blog reports that the state senate unanimously passed a bill over the weekend that would eliminate time restrictions on when blood alcohol tests may be administered to boaters suspected of drinking and boating. If the Connecticut law under consideration got your attention, so will this news from Florida from CBS 4. The son of billionaire and mega yacht owner H. Wayne Huizenga was sentenced to jail for two years Friday for violating his probation when he drank alcohol and operated a boat while intoxicated. Mercury news is reporting that regulators at Lake Tahoe say they plan to crack down this year on boaters, jet skis and others who zoom to close to shore. Violators of the long ignored 10-year-old law may face as much as a $5,000 penalty! The BP oil spill of 2010 is nothing less than a huge cluster-fudge that has resulted in, among other things, a ban on fishing throughout much of the Gulf and a hazard for recreational boaters. More on this later. Are you facing any recently passed laws where you boat that are hampering your enjoyment of boating, or are you in favor of restrictions being put in place to improve the safety of everyone on the water?